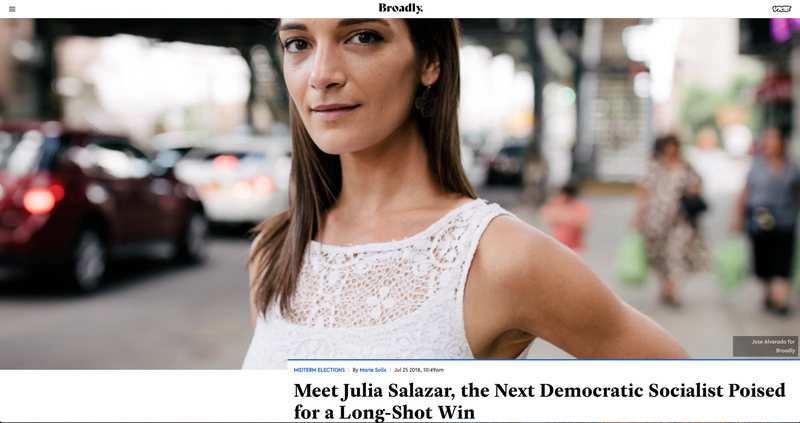 Meet Julia Salazar, the Next Democratic Socialist Poised for a Long-Shot Win by José A. Alvarado Jr.
Last month in July, I had the privilege of documenting 27-year-old first-time Latina candidate for NYS Senate Julia Salazar and her Bushwick campaign office for @broadly last week. Thanks @msolis14 for asking me to document this unique candidate. Julia Salazar is a 27-year-old first-time Latina candidate hoping to unseat a longtime incumbent in the New York State Senate, whose views she says don't address the ongoing inequalities in her district. By José A. Alvarado Jr. — Hey Everyone! I'm excited to announce some of my work documenting the resilience of my family and the barrios in Puerto Rico we call home..
By José A. Alvarado Jr. — My photographs documenting Rep. Alexandria Ocasio-Cortez’s road to Congress are in issue 392 of Le Monde, M Le magazine du Monde, accompanied..
By José A. Alvarado Jr. — I’m beyond thrilled to be showing my work at ICP alongside a group of very talented artists, curated by the great folks at Forfreedoms. If any..
By José A. Alvarado Jr. — Portrait of singer, songwriter, and producer Steff Reed. The self-taught multi-instrumentalist’s life in music began at the age of thirteen..
By José A. Alvarado Jr. — For the last eight months, I documented a group of inner-city residents in their twenties from the Boogie Down Bronx, Queens, and Brooklyn as they..
By José A. Alvarado Jr. — What a year this has been! Two-thousand-eighteen you have been an adventure, to say the least. It was a year that started quite slowly but ended in..
By José A. Alvarado Jr. — Alexandria Ocasio-Cortez displays the boots she wore for the first 8 months of her campaign. She started her campaign back in 2017 with a dream. A..
By José A. Alvarado Jr. — Vanity Fair France published my photos from my project documenting Alexandria Ocasio-Cortez humble beginnings and historical grassroots campaign run..
By José A. Alvarado Jr. — As some of you may know over the past few months since early December 2017, I have spent time traveling to the Cordillera Central region of Puerto..
By José A. Alvarado Jr. — In early March this year, I was asked to photograph UFC 12-0 fighter and avid fisherman Gregor Gillespie, in Long Island, New York by The Anglers..
By José A. Alvarado Jr. — For the past twelve months, I had the privilege of documenting a 28-year old Bronx woman of Puerto Rican heritage, run for office in NY-14 - a..